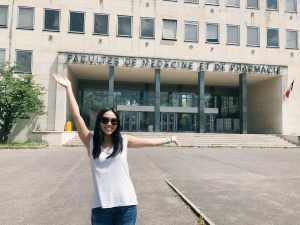 This is a series of entries from rising second-year student pharmacist Dominique Dairion. Originally from Little Rock, Arkansas, Dairion is currently abroad in France with the International Pharmaceutical Students’ Federation (IPSF) Student Exchange Program through the American Pharmacists Association Academy of Student Pharmacists. Learn more about her journey below! 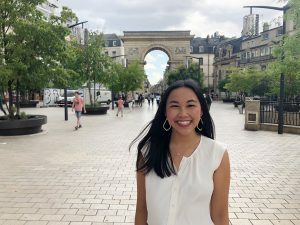 As my time in Dijon, France, comes to an end, it is surreal to think about how much I have learned and experienced in such a short amount of time! For my last week, I was given the opportunity to visit the Georges-François Leclerc Center for Cancer. At GFLC, I shadowed pharmacists and pharmacy residents during rounds and toured the radiopharmaceutical (nuclear pharmacy) area. Having the opportunity to shadow during rounds was an interesting experience because I was able to recognize many of the chemotherapeutic drugs being used from classes I took this past semester. It was very exciting to see material I learned in class being used in real practice through the actual distribution of the chemo and patient counseling. After shadowing rounds, I toured the radiopharmaceutical area. At GFLC, radiopharmacy is used for diagnostic and therapeutic practice. Some of the radiocompounds are even created in house at the cancer institute. Radiopharmacy is an area of pharmacy that I was not previously familiar with, so it was very exciting seeing it in practice. These past three weeks have flown by, and I cannot imagine having a better experience! I am so thankful for all of the opportunities I have been given, and am very excited to bring back what I have learned. I have loved my experience at the University of Burgundy, but I’m excited to come back home to the UMSOP. I am halfway through week two of my internship and, like all good things, it is going by very quickly! My work in the toxicology lab has expanded, and we are working on culturing new types of cells. One of the labs in the toxicology department is focusing on cancer research, specifically new drug delivery systems. Dominique Dairion in Dijon’s City Center. To be able to conduct this type of research, the professors need cancer cells to study their properties. We are currently working on isolating and culturing colorectal adenocarcinoma cells for this purpose. The research itself is very interesting, but being able to be hands on in the lab has been the most exciting part. Working in the lab has also given me the opportunity to meet other students here at the University of Burgundy. 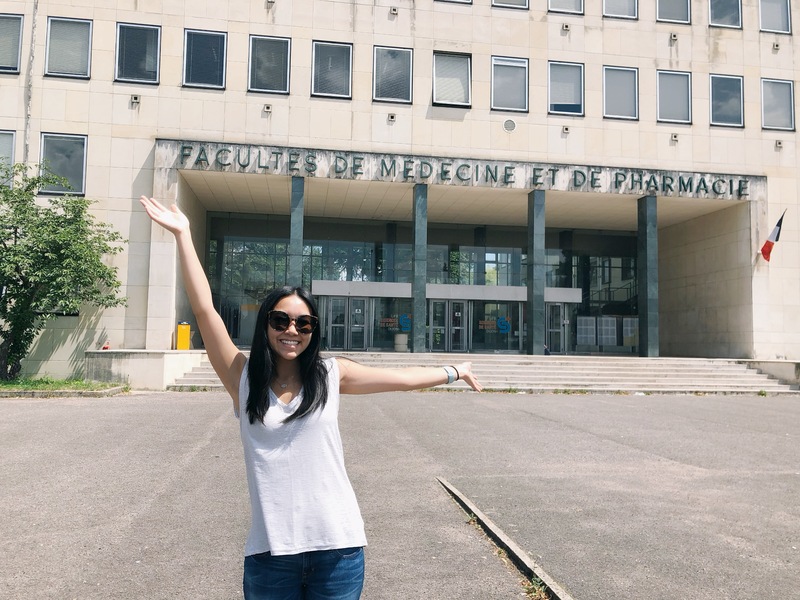 The toxicology lab is located in the building for pharmacy and medical students, so I have enjoyed meeting some of the students and learning about their experience in pharmacy school here in France. While we may be in completely different schools thousands of miles away, it is funny to see that their experiences of going to class and studying for exams are similar to ours at the UMSOP. 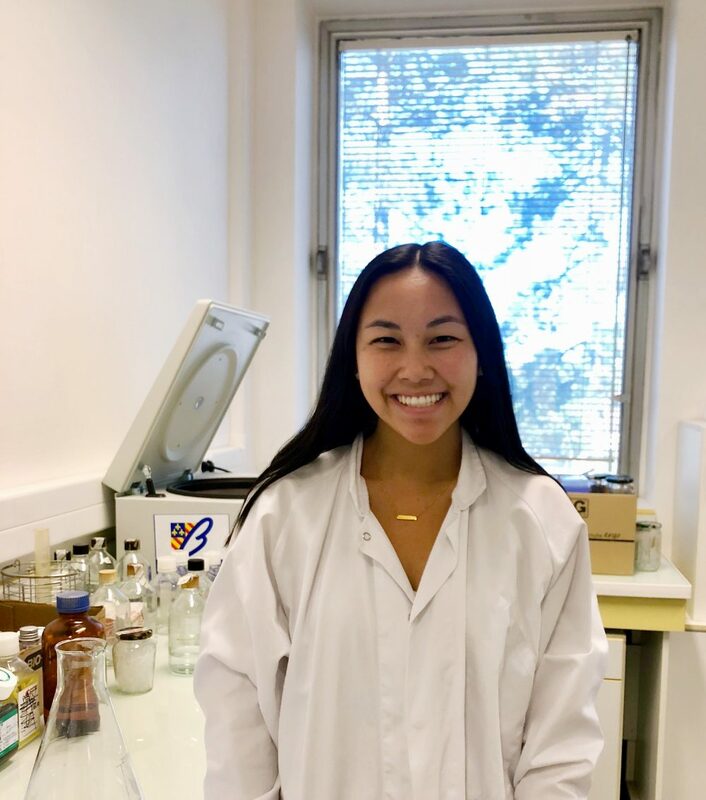 This summer I have the opportunity to intern at the toxicology research lab at the University of Burgundy in Dijon, France. Dominique Dairion in the research lab. The toxicology research lab is working on different projects staffed by different professors at the university. The project that I have been working on is focusing on separating monocytes from a blood sample and using growth factors to differentiate them into M2 macrophages. These M2 cells are being studied for their anti-inflammatory properties for potential use in decreasing the symptoms of inflammatory bowel disease (IBD). The research has consisted of a lot of hands-on learning, and I have enjoyed the experience of working in the lab. When I am not at the lab, I have enjoyed exploring the city of Dijon. Dijon is a wonderful town nestled in the heart of the Burgundy region and is filled with rich history and culture. My favorite place to spend my free time is in the city center. The city center is a great area to find lots of spectacular architecture, shopping and food. My favorite meal so far has definitely been Coq au Vin, which is chicken braised in wine. Coq au Vin is a specialty in Dijon because Burgundy is famous for being of one France’s principle wine making regions. I have enjoyed my time here so far, and look forward to the many adventures to come!